Produktinformationen "ASTRO ZOMBIES - Frogs Legs LP"
FROGS LEGS ist ein fantastisches neues Album des französischen Psychobilly Trios, THE ASTRO ZOMBIES! 12 Songs über Monster, Zombies, verrückte Affen und mehr! Die ASTRO ZOMBIES sind wieder „back to the roots“ und präsentieren ein witziges Stück Psychobilly mit hohem Spaßfaktor! Vive Le France! 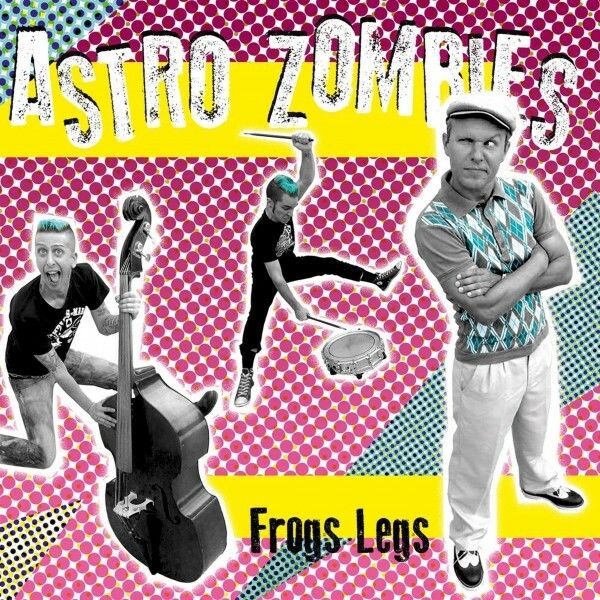 The Astro Zombies, everyone’s favourite Gallic rockabilly troubadours are back. Not only back, but back to the revolution and deadlier than Madam Guillotine. Not the revolution that saw aristocratic heads roll, but the evil wicked mean and nasty musical revolution of the 1980’s, psychobilly. Que se passe-t-il?! I hear you cry, and quite right too, of course Bobby and the boys have been performing rabid psychobilly since 1996, their first album conceived in Paul Fenech’s very own studio. Mais méfiez-vous, for this album, the boys have gone way back to the roots, this is vieux école flavoured with garlic and cuisses de grenouilles. That’s not to say a history lesson, they’ve taken the excitement and flavour of early psycho, dragged its carcass to 2015, added red wine and their own surprises with twists to taste. Frog Legs has all the ingredients to raise the roof of any party, it’s fast, it’s furious, it’s funny and it rocks like crazy. If there were a society for the protection of instruments the Gendarmes would soon be kicking down the Burgundy door the Zombies lurk behind. No mercy is shown to the poor battered double bass, drums and guitar for 12 rumbustious tracks. These 12 tracks take you on a wild ride, from the delights of eating dismembered amphibians’ limbs and fishy fingers via the perils of reptilian men, monsters, zombies and crazy monkeys, all resulting in a pungent platter. The Astro Zombies; unmistakably French, undoubtedly psychobilly and most definitely cooking on gas. Music with aroma. Merveilleux! Weiterführende Links zu "ASTRO ZOMBIES - Frogs Legs LP"
AL & THE BLACK CATS - From Bad To Worse LP ltd.
SICK SICK SINNERS - Road Of Sin LP ltd.
SPACE CADETS - Space Cadet Psychos 7" ltd.
AS DIABATZ - Nightmares In Red LP + CD ltd.
BANANE METALIK - Nice To Meat You LP ltd.
ASTRO ZOMBIES - Frogs Legs LP Testpressing ltd.
MONSTERS - Pop Up Yours LP + CD!